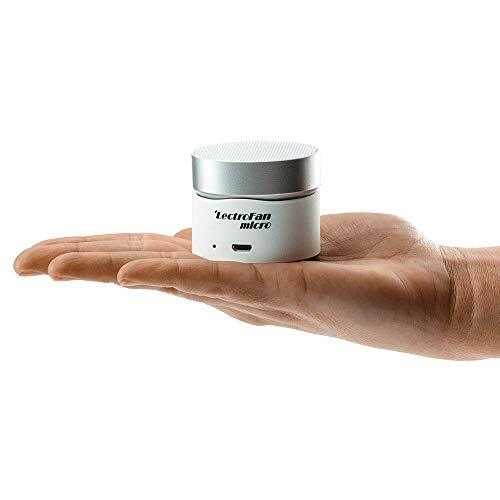 The LectroFan micro is a compact portable white noise and sound machine that offers many uses from privacy to a good night’s sleep for all ages. The micro has 10 unique non looping sounds including 5 different fan sounds, 4 white noises, and an ocean soundstory. The sounds can be personalized with the ability to precisely select the volume from a whisper to significantly louder than a mechanical fan. The rechargeable battery lasts up to 16 hours while playing its built-in sounds and 6 hours while streaming audio via Bluetooth. Find the right combination of sound and volume for your best night’s sleep. Pair the LectroFan micro with your phone and have a powerful Bluetooth speaker that can go anywhere. Twist the micro to direct the speaker for upward or forward facing sound. Adjust the volume with the precise 1db increments for the perfect level from background music to a concert experience. The micro is rechargable and has a 6-hour playback battery life when fully charged with the USB power cable.